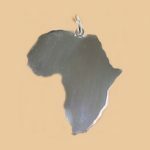 Sterling silver shiny medium Africa pendant with large heart cutout to show you left your heart in Africa or your heart belongs in Africa. 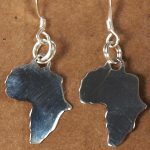 Or simply your heart goes out to Africa. or you love Africa a lot and support them regardless. Is your heart in Africa? Did you leave your heart in Africa? 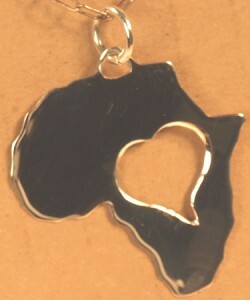 Do you have a big love for Africa? Tarnish resistant sterling 930 silver. Hand made. 3cm tall – approx 1 1/4″ Why not add a sterling silver chain too?